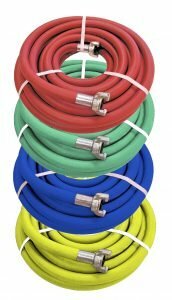 Jackhammer hose assemblies, or air compressor hoses, are available in a variety of colors, sizes, and pressure ratings. Our stocked assemblies in 3/4 inch include red, green, yellow, and blue cover domestic EPDM rubber. 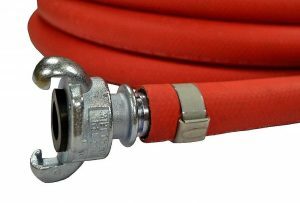 1 inch hoses are available in red 200 or 300 PSI grades. We also offer a heavy-grade wrapped cover yellow hose, type 1801 and wire-reinforced yellow bull air hose, type 1803. Our most common jackhammer hose assembly couplings are universal Chicago type couplings. Other popular jackhammer or compressor hose coupling options are Bowes or Thor interchange couplings, which both offer improved safety features. We can also provide custom configured hose assemblies with your choice of air service hose couplings. Our compressed air hose assemblies are made from domestic EPDM rubber which is an elastomer that is known for good all weather flexibility, ozone resistance, and durability. EPDM hose can handle a light oil mist such air supplied by a compressor with an inline oiler installed. For oily environments, a nitrile rubber hose may be more suitable, such as our type 1503, 1801 or 1803 hose series. Type 1502Y, 1801 and 1803 are all yellow cover hoses, so be careful in selecting the correct hose and when replacing an existing hose. does not meet the pressure rating labeled on the hose. Always use hose safety whip check cables to protect operators and people working nearby from potential hose failures. Whip check safety cables can significantly reduce the hazard of an unrestrained pressurized hose, and can fulfill requirements by job safety oversight organizations.